This chicken recipe always impresses despite it’s relative ease. Even if you’re not a blue cheese fan give it a try as the cooking substantially mellows the flavor. The sweetness of the figs and nuttiness of the walnuts help to offset the strength of blue cheese as well. 8 fancy figs (the bulk ones are fine- in fact better than fresh in this recipe because there will be less liquid. Cut 4 thick slices of the cheese (about the length and width of your middle finger. Take off the stems and tough bottoms of the figs and chop them into small pieces. In a bowl combine the cheese, figs and walnuts and mix until well combined. 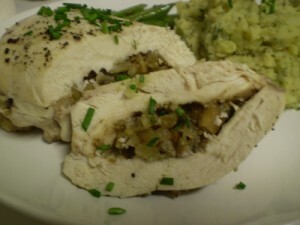 With a sharp knife pierce into the narrow end of the chicken breast as deep as you can without breaking through. With your finger, widen the cut until you have a nice pocket inside the breast. Pack this space with the cheese mixture, pushing it in firmly so that it is almost bursting. Season breasts with salt & pepper and put just a small sprinkle of water in the bottom of your baking dish (a couple of tbsp) and bake covered for 20 min at 350. Spoon the cooking juices over chicken and enjoy!